Unwind with this quick getaway in Bhandardara that will give you the much needed break you’ve been longing for. Find yourself in the lap of nature with the rugged Sahyadris towering around and you'll sleep in a cosy tent in the wild. With delicious Maharashtrian meals, crispy BBQ snacks and a fun dinner of Maggi and soup, you're sure to be a happy camper! 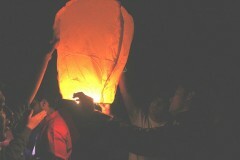 This is an ideal camp for a group of friends looking for a easy escape with a lot of laughter. NOTE: There are twin and multi sharing tents at this campsite, all at the same cost. Twin-sharing tents will be allocated to early bookers. IMPORTANT: Children under 16 are only allowed in groups of 10 or more. Nestled in the Western Ghats of Maharashtra, Bhandardara is a charming village about 185 kms away from Mumbai. 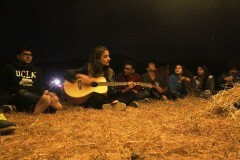 The campsite is situated on the banks of the dam reservoir and offers scenic views of the water and of the peaks around. You'll be camping in twin/triple sharing tents equipped with sleeping mattresses. There are also dry pit toilet tents on camp. 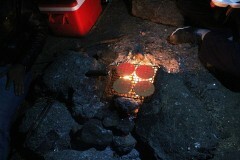 There is a camping crew to set up tents and cook meals, but you're welcome to try your hand at both. 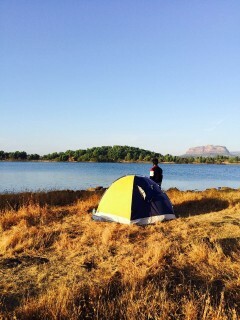 • Spend a night at this lakeside campsite in Bhandardara. 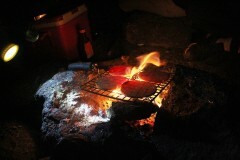 • Enjoy an evening with a bonfire, unlimited BBQ, and starry skies above. • Wake up to scenic views of Kalsubai, Bhandardara Lake and Pravara River. 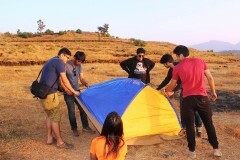 This Bhandardara camping trip is a non-strenuous activity, and is suitable for anyone. However if you have a heart condition/or any respiratory problems like asthma, or any form of allergies, kindly check with your doctor before booking this camping in Bhandardara trip. 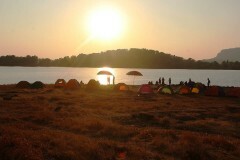 Swimming in the dam reservoir is strictly prohibited while camping in Bhandardara. You must adhere to the instructions of the camp leader at all times during activities. Participants must smoke in the designated smoking area only. Littering in or around the campsite is not permitted. 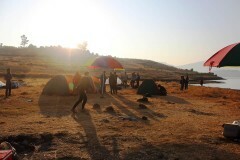 This Bhandardara camping trip cannot be cancelled once booked, however, you can transfer the booking to friends or family members. 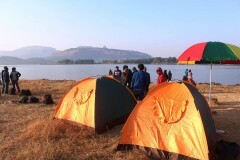 This Bhandardara camping trip is arranged considering normal weather. In case of cancellation of any event due to reasons beyond control such as natural calamities, riots, political uncertainty, public transport failure etc., no refund will be granted. The operator will not be held responsible for any case of injury, damage to self or property, or death during the camping trip in Bhandardara. 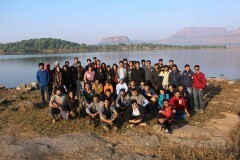 Participants must provide accurate information while making the booking for this Bhandardara camping trip. The operator will not be responsible for any inconvenience or loss suffered due to wrong information provided by the participant. All photographs taken by the operator or its representatives are the sole property of the organization and will not be shared or allowed for use on social media. Any additional costs incurred due to unforseen circumstances during the trip have to be borne by the participant. 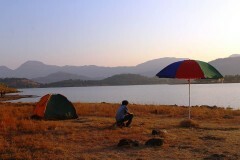 Camping in Bhandardara can be organised on weekdays for a minimum of 10 participants. 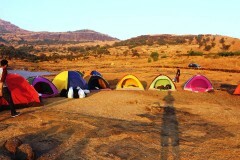 Children need to be accompanied by 10 participants or more for this camping in Bhandardara. Charges for children below 5 years: no charge; children from 6-10: INR 630 per night; children from 11-15: INR 1150 per night; children from 16-18: INR 1730. You'll have to report to Dadar Station by 10:00 hrs and board the local train to Kasara. Once you reach Kasara, hop in to a jeep and travel to Bhandardara. You'll reach Bhandardara by 15:00 hrs and dig into a delicious serving of misal pav. After this, you'll hike to the campsite, where you can help set up tents. After sunset, a bonfire is lit, and you'll be served unlimited BBQ snacks. By 20:00 hrs, you'll start cooking Maggi and soup for dinner and after eating a delightful meal, you can spend the night stargazing. Retire in cosy alpine tents for the night. Wake up early to make the most of your time at this scenic campsite. You can take your tea to the edge of the water to admire the views. You'll eat a filling breakfast at the campsite and after this, you'll board the jeeps and will be driven back to Kasara Station. Once at Kasara Station, you can board the earliest train back to Mumbai. Trip ends in Mumbai. Personal expenses such as packaged water, soft drinks, alcohol, telephone calls, tips, etc. Arrive at the campsite by late afternoon and dig into a delicious meal of misal pav. You have the rest of the day free to explore the campsite and indulge in indoor games. In the evening, you'll gather around the bonfire and munch on crispy barbeque snacks with roasted potatoes, paneer, veg patty, chicken sausage and chicken salami. Eat a fun meal of Maggi and soup for dinner and after this, you'll retire to cosy alpine tents for the night. 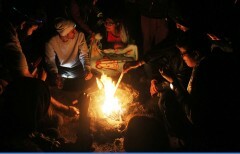 Do carry a thick blanket or shawl to keep you warm. Trip ends by lunch time. Wake up to scenic morning views of the misty Sahyadris and Bhandardara dam. You'll eat a delightful breakfast of bhajias, omlette and tea/coffee and after this, you'll pack up and head to Kasara Station. You'll take a train to Dadar from here and once you reach Dadar, your trip ends. Dadar is one of the busiest stations in the city and is on both the Central and Western railway network. You can get to Dadar Station by road or rail transport. 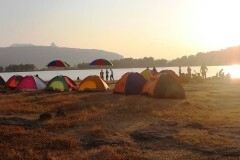 Your operator will arrange your transport to the start point of this camping trip in Bhandardara.